I cannot recall the opening of a new concert hall in Europe create such a brouhaha as that which surrounded the inauguration of the Elbphilharmonie in Hamburg in January 2017. In the UK, in the last 30 years, we have been fortunate to have superb new halls built in Birmingham and Manchester, but the Elbphilharmonie was even more newsworthy, not least because of the arguments over its construction coming in way over budget, but also because of its supposedly state-of-the-art acoustics. One telling detail about the official opening concert there (it took place on January 11, 2017) was the choice of Benjamin Britten’s Pan for solo oboe (from the Six Metamorphoses after Ovid, Op. 49) as the first piece to be performed. A couple of days later a work on a completely different scale was given its first performance there. This was Jörg Widmann’s Arche (Ark), the official commission for the hall’s opening. His title was clever. Not only does the hall resemble an enormous ship (both inside and out) but the Greek word Arche (αρχή) means ‘beginning’. Widmann’s evening-length work could not be characterised as lacking ambition. It is scored for huge forces, and the goal is to reflect the entire history of ‘enlightened’ (sic) Christian Europe via allusions to a plethora of Biblical and other philosophical sources. While it is broadly speaking an ‘oratorio’ (at least in Widmann’s designation), its last two sections also indirectly mirror the structure of the Requiem Mass. A couple of general observations first. ECM seem incapable of producing poorly recorded discs, so the vividness and immediacy of their superb sound is no surprise. This is a new hall, and Widmann does not hold back in terms of the forces he uses (some 300 performers are required in total, although in actual fact tuttis are used sparingly), so the sonic detail is breathtaking. A limitation I found with the package, however, is the lack of a libretto/text/whatever you want to call it. The breadth of Widmann’s sources is considerable (15 are listed on the sleeve!). Given the collage nature of their deployment (and my limited understanding of spoken German, the language used mainly, though not exclusivel), Dieter Rexroth’s notes which give an overview of each section are not sufficiently helpful. As ever, Widmann’s huge piece clearly has a degree of visual theatricality, judging from the reactions of the audience. There is a fair amount of laughter but I’m afraid the joke goes over my head. Based on the authors listed (all long deceased), I cannot imagine copyright being an issue, and while I buy into ECM’s often Zen/Minimalist approach to packaging, Rexroth’s long introduction suggests that is not part of the aesthetic here. There are no excuses for the lack of text, as far as I can see. Arche sort of rolls like this: the two big opening movements seem to be based on biblical sources – the Creation myth and the Flood myth. A large central panel incorporates a weird ‘love-duet’ between the solo soprano and baritone, delivered against a backdrop of tragic operatic clichés and gestures. The final two movements are shorter and loosely structured around sections of the Requiem Mass. The fourth is a seismic Dies Irae which is effectively an apocalyptic battle between competing choirs representing the forces of good and evil. It concludes with a liberal helping of post-modernism in the form of alternatively moving and satirical references to Beethoven’s Choral Fantasia (one really does not know whether to laugh or cry, not least in the context of the political crisis currently engulfing the UK). The concluding Dona nobis pacem is the diametric opposite of consolatory; it features as imaginative writing for childrens’ choir(s) as I have ever heard and builds to a monumental, speaker-busting climax. The very opening of the work seems a rather literal account of ‘Creation’, a melange of disparate orchestral and vocal squeaks, breaths, slides and rumbles before an extraordinarily assured and dispassionate child narrator provides an introduction/commentary. Choirs threaten to get into some sort of stride but quickly disintegrate. There is quasi-‘aria’ which briefly suggests an ‘oompah’ band, and some beautifully ethereal harp and percussion textures. The splendid baritone Thomas E Bauer provides a smoothly expressive aria (the text sounds especially important here and its inaccessibility undermined my listening experience) over Widmann’s oddest, glassiest sounds before a lush, Bachian chorale. The second ‘Flood’ movement, Sintflut, is inevitably more fluent and visceral, Dissonant organ, scurrying strings and apocalyptic drums augur imminent catastrophe. The music is certainly terrifying and immersive at times, but also diffuse, episodic, and disconnected. Much of the choir music consists of disturbing, distorted chorales, familiar and disarmingly strange by turn. As this movement approaches its apogee, we hear the soprano for the first time. Marlis Petersen offers an ethereal, tentative solo drenched in glissandi before the traumatised choir sign off. The third section Die Liebe (Love) seems to be pivotal to the entire work, a love duet in essence, which could tip the balance one way or the other. It begins with a dialogue between the (adult) soloists , its content rather Berio-like in its theatricality. Widmann provides deft instrumental touches. As the movement unfolds, the tension seems to increase, although there is a rather tender passage for the soprano juxtaposed with a lied-like phrase for the baritone in what appears to be a barcarolle-type episode. But again, alluring and fascinating though this music certainly is, the lack of text is profoundly frustrating. I suspect this may prove to be a bridge too far for some listeners. The final Dona Nobis Pacem section starts with the furious chanting of a childrens’ choir seemingly declaiming a lexicon of 21st century evils. This unforgettable vocal ‘riot’ is occasionally punctured by Ligetian motor-horn sounds and percussive crashes, before their uninhibited vocalisations elide into a passage which sounds oddly marine, all harps and tuned percussion. The Dona nobis pacem prayer is shared between a boy treble whose material seems weirdly distorted and other individual soloists from the choir. Finally a rather saccharine, presumably ironic soprano solo is drenched by Mahlerian harp and strings, and Arche reaches its terminus with a huge crescendo in an extended, ecstatic chord. 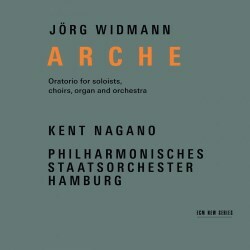 I have to say one of the enduring fascinations of Arche is Widmann’s performing material for children, as speakers, soloists or in choirs. In no way whatsoever does this composer talk down to them. It is no exaggeration to suggest that rather than stealing the show, these young people ARE the show. They all manage challenging parts with confidence, exuberance, with real swagger and even diffidence. Both young narrators, Jonna Plathe and Barıs Özden, are quite magnificent, notwithstanding my lamentable German. The treble Gabriel Böer seems to relish what appears to be a tricky part, especially given the infernal din going on around him at times. Nor will listeners easily forget the contributions of the young voices at the outset of the final section. It goes without saying that the adults are pretty good too, while Kent Nagano holds the entire structure together with a confidence and commitment hewn presumably from the benefit of rigorous preparation and adequate rehearsal time. Conceptually speaking, Widmann’s work seems to display philosophical parallels to some of the theatrically driven concert works of Leonard Bernstein, of all people. Is it too simplistic to see Arche as a ‘crisis of faith’ piece akin to the American’s Kaddish symphony or Mass? In the final analysis, I must concur with my colleague Dominy Clements’s precise and insightful review. Arche needs more than one spin. Ultimately I suspect it will divide listeners but this thrilling recording is certainly worth a couple of hours of any serious music lover’s time. It will be fascinating to see if it transcends the ‘pièce d'occasion’ tag. This document of its premiere is far more than a souvenir and will do Widmann’s ambitious undertaking no harm at all.